Belgian waffle maker, cooking, food, homemade waffles, made-from-scratch, Mennonite cooking, waffles, Whatever Happened to Dinner? Doesn’t your family deserve made-from-scratch waffles? Several years ago for Christmas one of my daughters got me a waffle maker (which is another story I’ll tell sometime). I had never particularly wanted one in my old kitchen because “where would I put it?” was always my question of the day when looking at some gadgety single-use kitchen item. Like who needs a grilled cheese maker, really. But after we moved to a new home in 2007, I hinted I might enjoy a waffle maker now that I had more room in our kitchen. 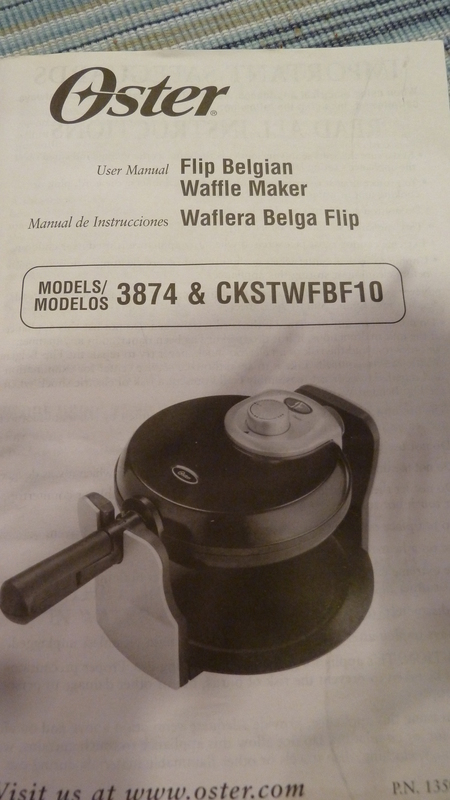 The recipe book that came with the waffle maker had this basic recipe—that looked way complicated at first. Who whips egg whites anymore, when you can just whip out a pancake mix and have (sort of) waffles in your waffle maker? I do. Now. Especially when the kids and sons-in-law are home for the weekend or a holiday. It is our special treat, and we usually eat until they are gone (the recipe makes probably 9 or 10 rounds of waffles–that’s 4 little sections in one round, and sometimes we share rounds). This is an awesome recipe and well worth the time to beat the whites and sift the flour. 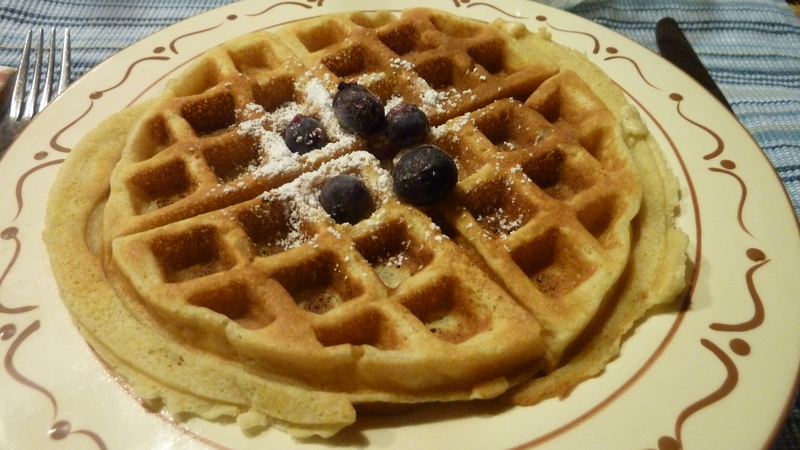 They come out airy and fluffy and thick—when you use a Belgian type “flip” waffle maker, as shown here. For this batch, I was at my daughter’s house helping with Sam and they just had the thin waffle maker kind, and the waffles were still great, just not as tall or airy. In large bowl, sift or whisk together flour, cornstarch, baking powder, and salt to blend thoroughly; set aside. 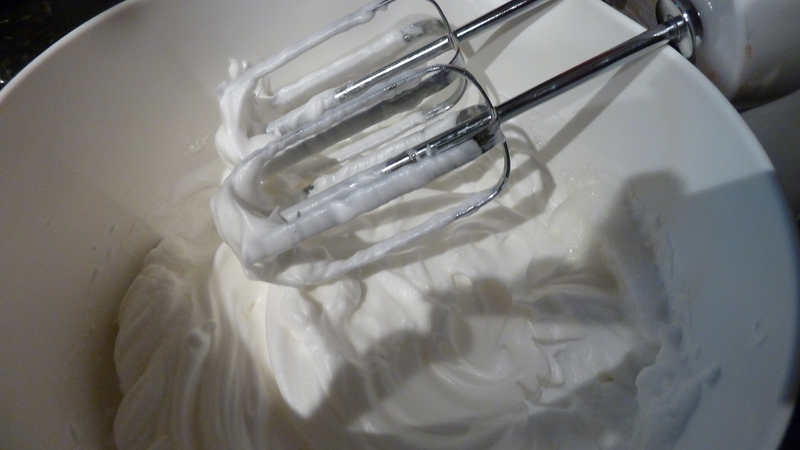 In mixer bowl, beat egg whites until soft peaks form. 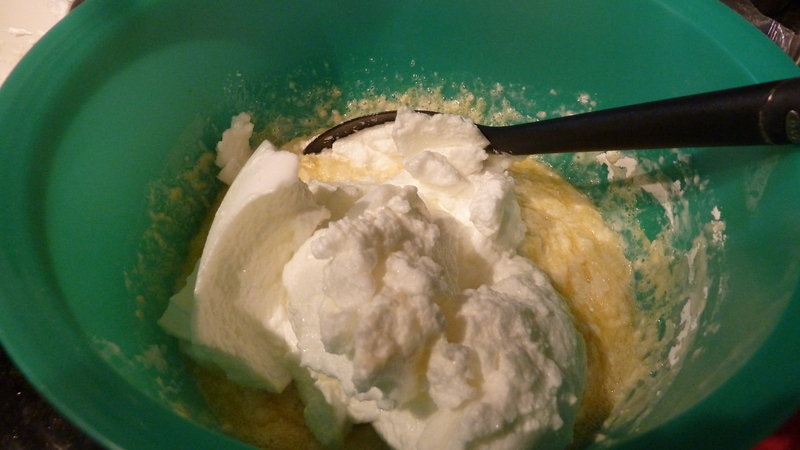 Add sugar; continue beating until stiff peaks form; set aside. 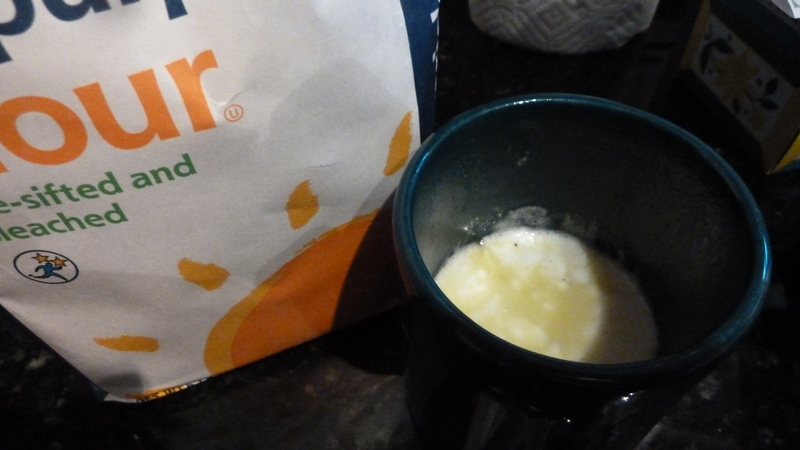 Separately, whisk together egg yolks, milk, and vanilla (not pictured). … and blend flour mixture with egg/milk/vanilla mixture until dry ingredients are moistened (there should still be small lumps; do not over mix). 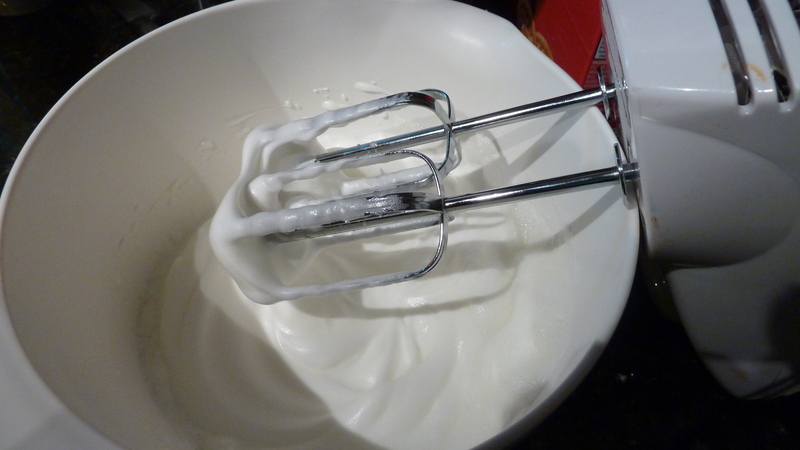 Fold in beaten egg whites until all combined to make your batter. 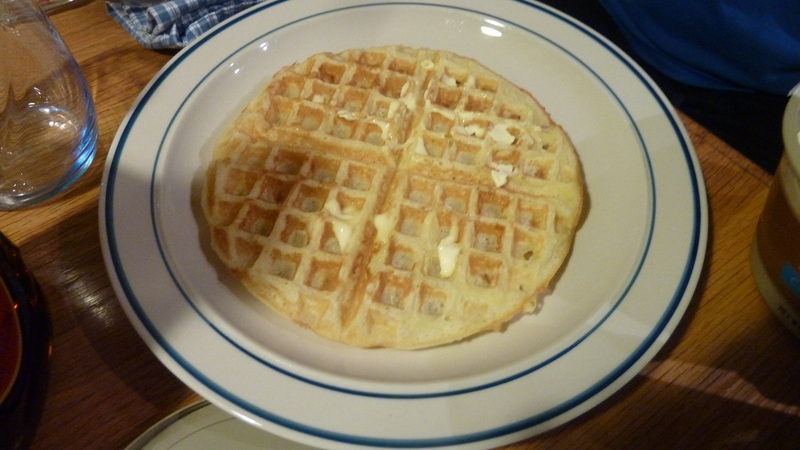 Pour batter onto hot, greased waffle iron and cook using instructions from the waffle iron. Makes about 5 ½ c. batter. **This is where I’ve adapted the recipe. 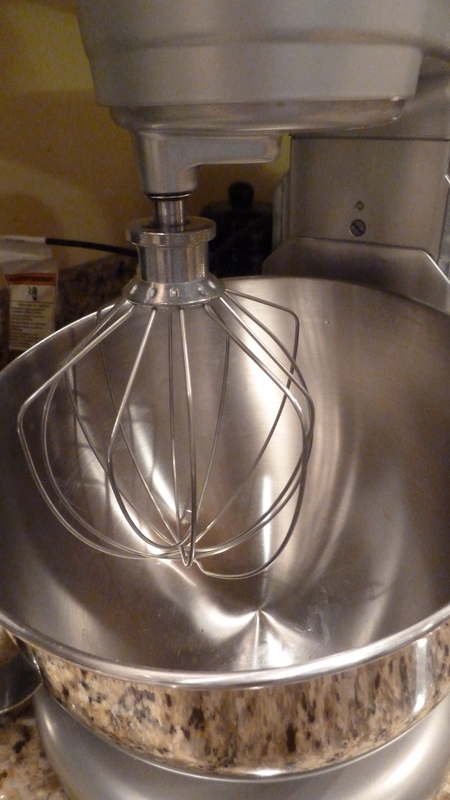 I use 4 eggs because my Kitchen Aid mixer bowl is so deep that the beater barely dips into the egg white using only 3. P.S. I wasn’t sure if I could beat egg whites with my daughter’s little old hand held mixer (that we bought her when she moved to an apartment in college). But sure enough, they beat up just fine, perhaps took a little longer. So way to go, little old apartment mixer. P.S.P.S. These freeze well, if you have leftovers. Just put a layer of wax paper between rounds in a freezer bag. Pop in toaster or microwave on a busy work/school morning. What is your favorite Saturday or Sunday morning breakfast? Who cooks it? Dad? Mom? Kids? IHOP? Alas, this waffle recipe did not make it into my Whatever Happened to Dinner recipe book but 100 some others did (not nearly all mine, and the recipe editors/testers did a great job), and here’s the scoop. Oh girl have I got a tip for you: find a copy of the book “Waffles Morning Noon and Night”. 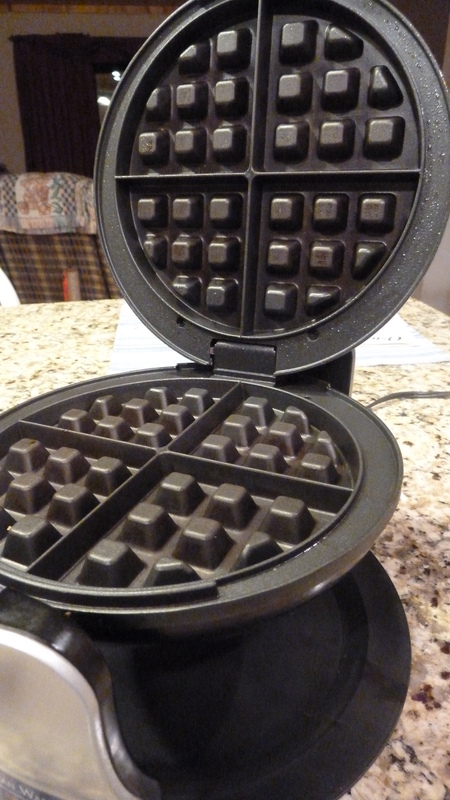 I had no idea how creative one could be with a waffle maker (garlic mashed potato waffles?) and how useful a waffle iron could be in fast meal prep. Forgot/no time to bake corn bread to go with the re-headed chili or soup? Make corn bread grids in a jiffy! Pumpkin bread grids for sandwich bread…oh so much fun! I guess you do have a great tip! I’ve never heard of this, thank you so much. I will check it out — fast meal prep? The corn bread grids sound like something I would use in particular. Thanks so much. Thanks for sharing. I love Jill’s tips. Never thought of using a waffle griddle for cornbread or garlic mashed potato waffles. I’m going to have to try that. Now I’m hungry for waffles. I may have to do breakfast for dinner. I love breakfast for dinner too. Let me know if you do the cornbread. I’m marking it down for me to try the next time I make chili soup. Thanks for the comment! Ron always make pancakes or waffles when any one of the grandchildren stay overnight with us. And a milkshake before bed! I think that is the only reason they want to stay with us. What a great tradition and thing for them to look forward to. I’ll have to warn Sam! Yes, every family deserves made-from-scratch waffles. My family loves waffles and my favourite way to eat them is with ice cream, or whipped cream and strawberries. No need for dessert with that on the supper table. Hmmm, I may have just been inspired to do a waffle post on my blog. After reading so much about your cookbook, Whatever Happened to Dinner, I’m also inspired to review it on my blog. Do you think Herald Press would be kind enough to provide a complimentary copy for that? Linda, for sure! I will look up your address and get it off you soon! Love your adornments for the waffles!